Photo Frank Woods hunting, Nelson Island. Tamakut imarpigmiutaat (yaqulget) qecigtunrularyugnarqut nunamiutarni. Makut-llu nunamiutaat allegyukaartut. Those ocean birds, I think they have thicker skins than ones of the land. And birds of the land have skins that tear easily. Atkugkiuquneng arnait pivkenaki, arnait evacillerpaulaata. Melqurrit'lartut aqsait. 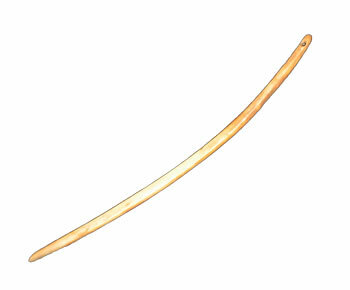 Makut taugaam angutait evacillrilnguut piksunaqluteng. 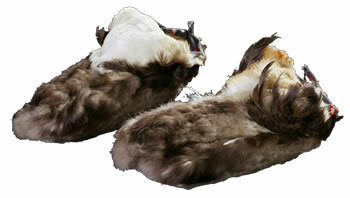 They didn't use female bird skins because nesting females usually had noticeable spots where they sat on their eggs. Their bellies were usually bare. However, males that had not nested were good to make into parkas. 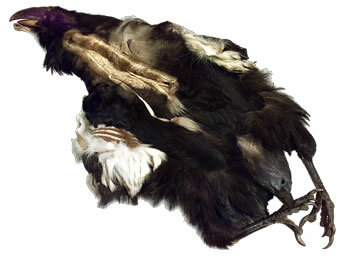 Not only did people prize bird skins for parka material, but they used their feathers and bones for many things--fire-bath hats, dance fans, dust brooms, needle cases, even peashooters. 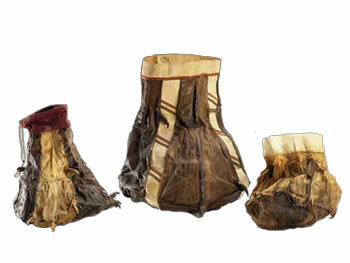 Coastal people who traveled to the Kuskokwim to fish for salmon, missing the annual bird drives, traded some of their dried fish for bird skins to make warm winter clothing. 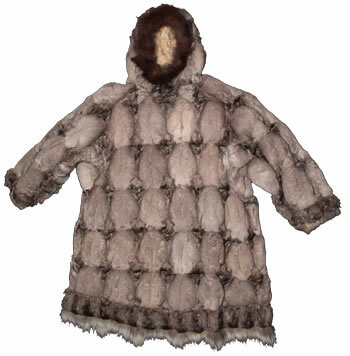 Thick bird-skin parkas were ideal winter wear but were also used during cold weather in summer. Frank Andrew recalled, "Water just rolls down their feathers and can't go inside. These Arctic loons and red throated loons are like that and cannot get wet." Paul John recalled: "When I was small, they made loon parkas for me. 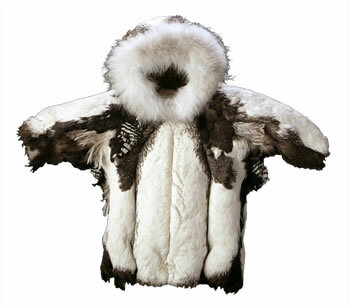 But when I was a little bigger, they made me parkas of eiders and long tailed ducks because they are warmer. 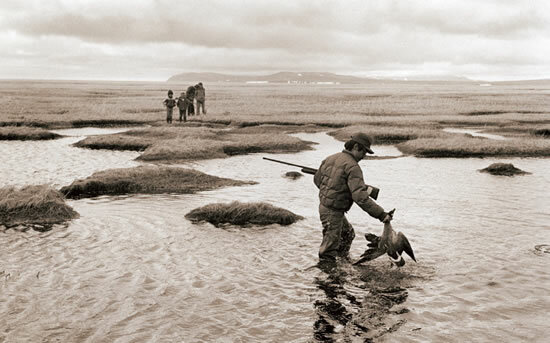 When I started hunting in the wilderness, I had emperor goose parkas." Maqissuun/Fire-bath hat made from a snowy owl. Frank Andrew commented: "They had head coverings made of bird skins for fire baths, with feathers on the outside and light colored belly skin for the edges." 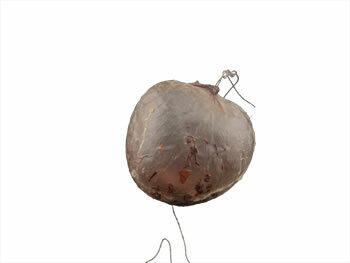 Dance fans made by Anna Kungurkak of Toksook Bay in 1970 from snowy owl feathers inserted into plastic coffee can lids. Henry Alikayak enthused: "The makers were very skillful, making something out of nothing." Kellarvik/Bag made from a raven's skin. Nick Andrew said: "They say ravens circle when they see a moose in the fall, since they will eat its guts if we kill it. Ravens are wise." 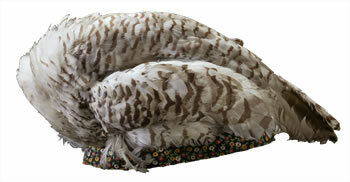 Kallakutaq/Ptarmigan stomach used as a child's toy. Kakuun wall' mingqun/Needle made from the front part of an uncooked crane's foot by Noah Andrew, Sr., 2007. 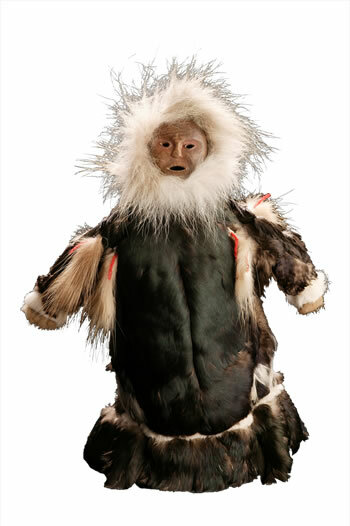 Irniaruam Atkua/Doll parka made of pelagic cormorant skin. Catherine Moore remarked: "When we lived on Nelson Island, there were so many cormorants on the cliffs! We went with a man who was hunting cormorants so his wife could make a parka. The black body is so shiny, with a dark green hue!"